Among the First Nations of the east, wampum was most often used to measure wealth and for gift-giving. 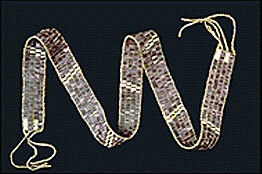 The wampum belt you see on the screen is made of small cylindrical shells strung together. In addition to being used as a means of payment, wampum belts also had ceremonial uses, such as the marking of peace treaties, the summoning of the various nations to war, or the recording of important events in the history of the people. In some cases, they were presented as marks of friendship and respect. The individual shells were also used to assess the value of certain goods. These shells also played an important role in the fur trade, which flourished with the arrival of the Europeans on the North American continent in the 16th century. 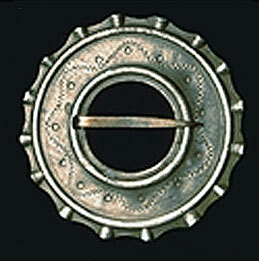 In exchange for furs, a person could acquire shells, a rifle, a woollen blanket or a silver brooch from traders. Aboriginals were extremely fond of silver objects, which were produced in large quantities by silversmiths in Europe and later in North America. This exchange of goods represented the use of the barter system.